I BLAME temporary insanity – which has lasted for, oooh, 33 years – after I spent £245 today on limited edition Star Wars Boba Fett artwork by Christian Waggoner. Honestly, I only went to the Generation Pop gallery in Manchester to look at their Star Wars exhibition, just give it the once over, and probably write a blog post. But when I got there, it was just so beautiful, so mesmerising, and before I knew where I was ….. 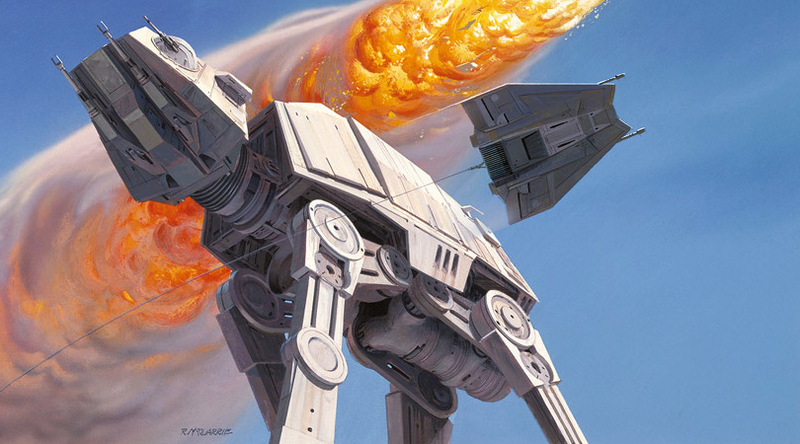 The exhibition featured artwork based on Star Wars by a range of artists, the most famous of which is Ralph McQuarrie who helped George Lucas realise his initial vision back in the day, as well as other shows like Battlestar Galactica. But there were also fantastic images by Chris Wahl, William Silvers, Jerry Vanderstelt, Brian Rood, Mike Kungl and Tsuneo Sanda. It is an awesome place to go to for any Star Wars fan. But right from the start, the artist whose work I kept on returning to was Christian Waggoner. His art work specialises in reflections and he has been putting that to good user in the Star Wars Universe for a while now. There’s a great piece on the official Star Wars site that will tell you all about it. The four on show in Manchester were Darth Vader (with Ben Kenobi reflected in his visor), a stormtrooper (with Rebel soldiers in the Tantive IV in the reflection), Greedo looking at Han Solo and my favourite, Boba Fett looking at Han Solo frozen in carbonite. Beautiful isn’t it? I must have walked around the gallery 10 times, but felt a connection to this from minute one. It intrigued me. What was he thinking? How long had he been staring down at Han? Hours? It reminded me of a similar image of the Joker by comic book artist Alex Ross as well as this. There were other nice images there, and cheaper ones too (the prices ranged from £50 to £400 or so) but eventually I bit the bullet, got out my credit card and bought it for an eye-watering £245 (Rob in the gallery knocked off £25 for me – thanks Rob). Because it is a limited edition – one of 95 – I should get it in a couple of weeks and I can’t wait. I’m already narrowing down places to display it in the house, where I can look at it about 100 times a day. Thank you my love, and yes, I do realise this gives you cart blanche to get whatever you want to as well. Just let me finish paying this off first though. I think you got an excellent deal. It’s sold out and impossible to find. I have seven of Christian’s pieces (two Disney, one Star Wars, and four of his “personal” work). He’s a great artist. Wow! Awesome! That’s a damn fine piece of art. Congratulations Neil. God I wish my other half was so understanding!! Excellent purchase my friend, where are you going to put it? Top bit of artwork that is!